So you want to create a digital magazine for your students but still did not find the right web tools to do so. Well now you can . we have just finished reviewing some great web services that you can use with your students to create and publish highly customizable magazines and newspapers for your class. I am pretty sure as you introduce the idea to your students everyone will want to have a say in their next e-magazine. There is nothing much more rewarding to students then to have a proof of their hard work recognized in a publication of some sort. Educational Technology and Mobile Learning has already published 7 Must Have Tools to Publish Students Work but today we are updating this list to include new tools. Most of the tools cited here are easy to use and have user friendly interface and they will let you create your own e-magazine or newspaper in few simple steps. Yet I would recommend your discretion as you use them with your students. UniFlip converts your magazine, brochure or catalog from its original PDF format into an exciting, professional multi-media digital format with pages that flip. Joomag is a web tool that lets you create your own magazines using a simple online editor. You can draw shapes, write texts, add rich media elements like video and audio players. This is like Scribd above. You can use it both as a document search engine and also as a magazine creator. This tools lets you create an ebook or magazine from posts and articles of a blog. Just paste in the url of the story and Zinepal does the rest. This one is a professional platform that provides teacher based templates to create mazagines. These magazines , however, are not free. This is most simple of all the tools mentioned here. 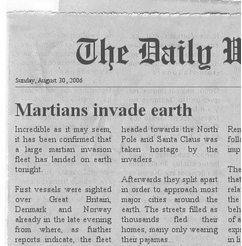 It also does not have many features yet you can use it to create a newspaper for your class. Just fill in your information and Fodey generates your newspaper. This is another web tool that allows users to create their own magazines without any need for advanced tech knowledge. content to your publications like videos and audios.